Salvation And Survival: Come All Ye Angels! I am so blessed to be surrounded by such Godly friends who constantly inspire me with their hearts of faith! And I recently had just a couple minutes of conversation with a good friend about one of my favorite subjects.... angels. 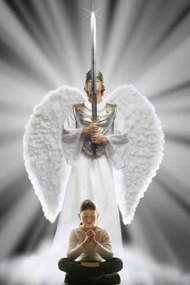 And then my husband, Mark, told me he was awake in the early morning hours today and while reading, he happened upon a 2014 article, titled How To Command Your Angels by Tom Brown. I am fully aware that just reading that title will be enough to send some Christians into shock. But it was enough affirmation that perhaps this is a subject that we should discuss, and so began my research. First of all, I want to make it perfectly clear, I do not worship angels! And I am perfectly aware that each time [in the Bible] a man falls to his knees to worship the appearance of an angelic being, he is told, as in Revelation 19:10, “You must not do that! I am a fellow servant with you and your brothers who hold to the testimony of Jesus. Worship God.” So, I want to assure you that I take that mandate in Scripture very seriously. That being said, I am also very aware of the importance and purpose of angels in the Bible. And Scripture is clear about their status when it comes to both Jesus and man, so let's establish a few things first, according to the Bible. As Believers, there should be no question that Jesus, as God, is the Creator of all things, including both man and angels. That's a no-brainer. Therefore we understand that He is superior to all things, right? But we also need to understand, as put forth in Hebrews, Chapter Two, the following truth: But we see Him [who for a little while was made lower than the angels], namely Jesus, crowned with glory and honor because of the suffering of death, so that by the grace of God he might taste death for everyone. For the short time that Jesus was on earth as a man, He was made a little lower than the angels. But that is not His reality today, as Chapter One tells us: After making purification for sins, He sat down at the right hand of the Majesty on High, having become as much superior to angels as the name He has inherited is more excellent than theirs. Jesus resumed His superior position when He ascended to Heaven to sit at the right hand of the Father. But what about our relationship with the angels? Where do we fit into the hierarchy, and what is our connection to angelic beings? I'm going to give you my rather unorthodox opinion, which I believe can be backed up by Scripture, and we will see where this theory goes... We are made in the image of God [and are primarily spirit beings as Genesis 1:26 tells us], and we were given dominion over the earth. I believe Scripture tells us that the angels were created before the Seventh Day: Thus the heavens and the earth were finished, and all the host of them (Genesis 2:1). While the word "host" sometimes refers to God's army or military, here it signifies angels, and is confirmed in 1 Kings 22:19, I saw the Lord sitting on his throne, and all the host of heaven standing by him on his right hand and on his left. 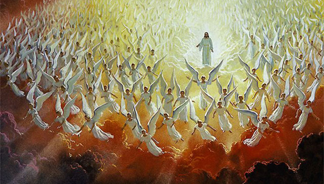 Yes, this could be the army of heaven, and if so, it is an army made up of angels. The primary job of angels is to do the bidding of God; to serve Him in various assignments. Those assignments include our protection, our deliverance from danger, the worship of God in Heaven, and to minister to our needs. Some angels are Messengers; chief among them is Gabriel. Others are Chief Princes; Michael is one. Still others are Divine Attendants, such as the Cherubim and Seraphim. Then there are those whom Timothy referred to as the Elect Angels; the Living Creatures as referenced in Ezekiel; and the Watchers whom Daniel mentioned. But in the context of this article, I want to concentrate on the "ministering angels" mentioned in Hebrews 1, because they are specifically referred to in relation to us. It seems that their job, according to all the references to them in the Bible is (1) to worship God (Isa. 6:3; Rev. 4:8); (2) to serve as messengers of God (Dan. 9:22; Luke 1:11, 26; 2:9; Rev. 1:1); (3) to serve as soldiers in spiritual combat (Dan. 10:13; Rev. 12:7); and (4) to serve as ministers to God’s people. At this time, I'm going to interject the controversy that is occurring in our theological discussions today. There are those [like me] who discern that these ministering angels can be called into service by Believers; and then there are those Believers who interpret that as giving angels more authority than they have, and it can border on worshiping them. But it is my humble opinion that it is not the angels who have the authority, but us, the Believer! You see, under the prior covenant with God, [and before the Cross], man had lost his authority. But after the Cross, Jesus has been "crowned with glory and honor", so that the angels submit to Him and His name. Scripture is very clear about this ... Who is gone into heaven, and is on the right hand of God; angels and authorities and powers being made subject unto Him (1 Peter 3:22) ... and That at the name of Jesus every knee should bow, of things in heaven, and things in earth, and things under the earth (Philippians 2:10). Here is where we really need to see the Big Picture. As I have put forward many times in the past, Believers need to recognize the power and authority given them by Jesus. Not only were we given authority over all the power of the Enemy, but we were told that anything we asked in His Name, would be given us. So when Jesus tells us in Matthew 18:18, Whatever you bind on earth will be bound in heaven, and whatever you loose on earth will be loosed in heaven, it should be clear that we are binding the power of the devil and his demons, and we also have the authority to loose the resources of Heaven. But how is that accomplished? Follow this line of reasoning ... Psalm 103:20 says, Bless the Lord, you His angels, You mighty ones who do His commandments, Obeying the voice of His word! By this, we should understand that angels in Heaven listen [and act] upon the VOICE of God's Word. We know that the Bible is His Word, right? But unless we SPEAK the Word, no voice is given to It. So, when Jesus spoke the Word during his temptation in the Wilderness, He was able to resist the devil, and afterwards, Scripture says, Then the devil left Him, and behold, angels came and were ministering to Him. The same is true for us! When we give voice to the Word of God, the angels in Heaven hear us, and are loosed to act upon the Word and carry it out in our lives! You've heard the expression, "Just say the Word", right? Well, when we quote Scripture aloud during our prayers, it looses the angels to do the assignments and work they were created to do. They have purpose and I believe they love working with us to see God's will done here on earth. Here's another way to look at it ... since Jesus announced that the Kingdom of Heaven "is at hand", and returned to His position in Heaven, we are regaining territory from the Enemy and coming into our own identity as His co-heirs. The full reality of the Kingdom of Heaven on Earth will not be fulfilled until Jesus's Second Coming, but it is important to know that we, as Faithful Believers, have been given His power and authority to act in His stead until He returns. And because we have been given the authority to use His Name to accomplish God's will, and the angels are subject to that Name, then we can loose them to help us do Kingdom work until Jesus returns. And at that time, we will co-rule the world with Jesus. And what does the Apostle Paul tell us in 1 Corinthians 6:3? That we will not only judge the world, but also judge the angels! In conclusion, I am clear about what Scripture says about angels and how they minister to us in our service to the Lord. Only God is worthy of our worship and praise, but He has created angels to minister not only to Him in Heaven, but to us, here on earth to see His perfect will done. And that's a partnership made in Heaven! Nehemiah 9:6 You are the Lord, you alone. You have made heaven, the heaven of heavens, with all their host, the earth and all that is on it, the seas and all that is in them; and You preserve all of them; and the host of heaven worships You. Belle, This is right on! Waiting on the church folk mired in their denominational and doctrinal soiled vestments to take anything resembling the wheel is maddening. Grab your angels and Yeshuas authority and start setting the captives free. If we are the hands and feet of Yeshua don't we have all his resource's at our disposal? Heck yea!! !